AARV offers free products as well as printed memorial cards available for purchase. All products are listed below. 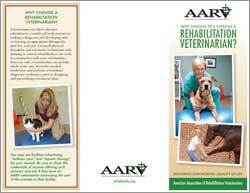 AARV has made its "Why Should You Choose a Rehabilitation Veterinarian?" brochure available as a free download. Click on the link or the brochure image to view the PDF in your browser and save the file to your computer. You may then print and distribute the brochure to clients and potential clients. The brochure is 8.5 x 11 inches, double-sided. Note: Gray horizontal lines may appear when the PDF is viewed in a browser, but they do not appear in the actual PDF. View and download high-res brochure PDF (4.2 MB). Please use the form below to order memorial cards from AARV. You may submit your payment by credit card or check. 5.5" x 4.25" folded cards with matching envelopes. The front panel includes original new artwork by artist Carol Lavelle of Hawaii. 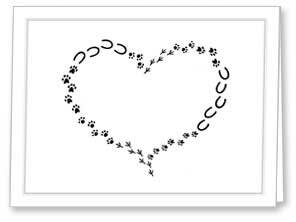 The new artwork, which was created for AARV, features pawprints, hoofprints and footprints from a variety of animals arranged in a heart. Inside panel contains blank space for personalization and the statement "This gift will support AARV's mission by providing opportunities for education and collaboration among veterinary professionals to introduce, educate, develop, and nurture the practice of rehabilitation in veterinary medicine and animal care." When you click on the Continue button, your information will be sent to AARV and you will continue to the next page for payment information. If you are paying by credit card, you will be asked to enter your credit card information on the next page.